It may be difficult for ladles handled by an over head crane or monorail system to keep up with the molten metal demand required by large capacity high-speed moulding lines unless several ladles are in use at the same time. This can cause handling issues, creating a bottle neck that can limit production. Over a full working shift operator fatigue can also be a significant factor in both slowing down production and in causing variable casting quality. 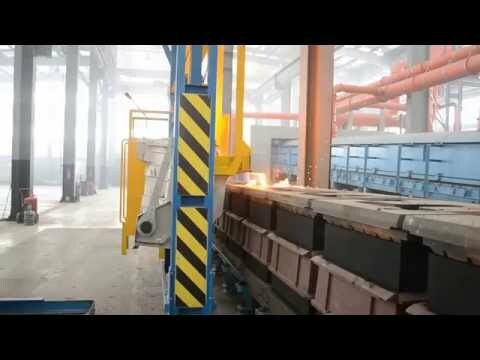 A fully automatic pouring system such as a heated pressure pour unit will overcome these issues but is both expensive and may not give the flexibility that a foundry needs, especially if the foundry is pouring different types or grades of metal such as grey iron and ductile iron. 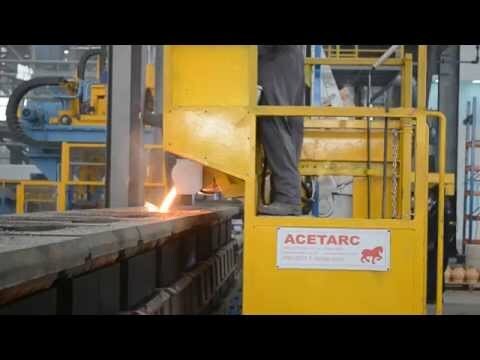 Acetarc can offer cost effective un-heated semi-automatic pouring systems that enable high pouring rates to be consistently achieved, reducing operator fatigue and giving the foundry the flexibility to change the specification of the metal being poured as the foundry needs to. The Acetarc un-heated pouring systems are based on either lip-axis or bottom pouring processes, depending on which method most suits the foundry’s requirements. All of our un-heated semi-automatic pouring designs are specially built to meet each foundry’s specific requirements. Therefore our sales literature can only give a small indication of the scope of our supply. Customers are always welcome to contact our design office to discuss their application directly with one of our experienced project engineers.